Such profound words and so full of power, they are! And though no one really knows who the human instrument was that God used to pen these words (some suspect King David because of the references to being surrounded by enemies and being disciplined by God, and also because of the prophetic verse concerning Christ which calls Him “the stone the builders rejected”), we do know that the Holy Spirit inspired them to teach us concerning a very real truth — worshiping God gives us access to His majesty and might. Did you get that? When we worship Almighty God — no matter what changes are taking place; no matter what unexpected situations are transpiring — we can become channels of His majestic splendor and His awesome power. If you missed it, then follow back along with me as we look more closely at this psalm. Our author has gone from thanking God to a couple of seemingly off topic subjects — anguish and freedom. We don’t know the issues that the writer is speaking of, but we do know that God brought freedom to this man; freedom from anguish. How? Through true worship. When we focus on God’s eternal and unchanging characteristics — in this case His eternal love for us — then we can access those divine traits in our own lives. When this is accomplished, not only do we achieve true worship but we unleash the power of God in and through our lives. In our next post we will look at Joshua’s encounter with God, in which he learned first hand that worship unleashes the power of God. We will also proceed in our in-depth look at this special Psalm, and continue to reveal proof that encountering hardship with an attitude of worship will allow us to become conduits of God’s power to a lost and dying world. Experiencing Hardship? Try True Worship! by J.Scott Harden is licensed under a Creative Commons Attribution-Noncommercial-No Derivative Works 3.0 United States License. 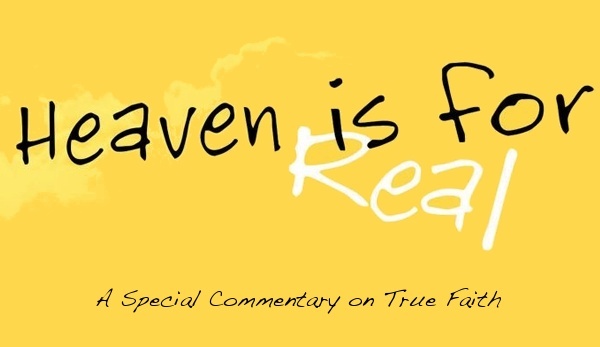 In Part One of this special post on true faith we talked of the Thomas Nelson publication, and the recent movie by Sony/TriStar Pictures of the same name, Heaven Is For Real. The message being presented by both the book and the film is one that states that to have faith one must “see, and believe, like a child.” To which I argued that a real childlike faith comes from believing without seeing. As we continue this look at true faith, recall with me the story of the Apostle Thomas. God’s blessing will not fill us by basing our faith on evidence, but by simply believing. Our hope comes to us through God’s promises. Those promises are fulfilled in Jesus Christ, and it doesn’t just concern forgiveness of sins or eternal life. It concerns all areas of our faith — all acts of worship. Missionaries who have surrendered to God’s calling to take His Gospel message to all parts of the earth — these men, women, and family units are placing their physical health and wellbeing on the line for the sake of fulfilling God’s plan for them. Yes, they are ignoring the physical dangers of this world for the sake of Christ’s call to “go and make disciples of all nations, baptizing them in the name of the Father and of the Son and of the Holy Spirit, and teaching them to obey everything I have commanded you.” (Matthew 28:19-20a) No, they are not listening to the “seeing is believing” Christians who would tell them to consider the safety of their own lives first, or to consider the safety of their family’s lives. No, they are simply answering a call to be faithful in what God is telling them to do, and to trust that God has their best interest in mind. And God’s best interest for humanity is not based on “creature comforts,” nor is God concerned with physical abundance in the areas of physical wealth, pleasure, and power. God’s good news is not a “Prosperity Gospel,” nor is it a “Poverty Gospel” — No! God’s Gospel message is one of provision. Meeting our physical and spiritual needs on a daily basis. 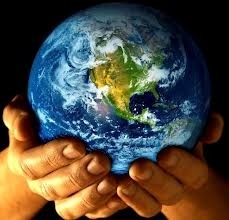 This creates a relationship between Creator God and created humanity. Some of you are aware that I am fighting a high staged colon cancer, and that I have opted to do so through diet, natural supplements, and naturopathic treatments. I have chosen to do so, not because of personal preference, or fear of conventional treatments (a.k.a. : chemotherapy, radiation, and surgery), but because God has led me down this path and I want to be faithful to act upon His calling. I have done so to the sounds of criticism and fear, which come from many people; some of whom are family members and others I count as friends. I understand that much of this comes from their love and concern for me, and their love and concern for my wife and children. But what is so frustrating to me, is that the majority of these who are judging and being critical of my choice to follow God’s course claim to be believers in Christ. 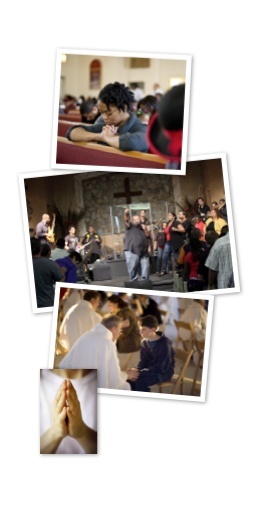 Some even serve in a church as a full-time minister of the Gospel of Jesus Christ. A career choice that is based on the entire premiss of following the calling that God has placed upon them. Yet, as I have stepped out in faith to serve God through this trial and test, I have been met with opposition and, at times, halfhearted support. Is not God the author of all of life? Is not God capable to see His purpose fulfilled in each of us? Are we not to step out in our faith and act upon it? Conventional medicine may play its part at some point, but only if God gives me, my wife, and kids clear direction. James, the half-brother of Jesus Christ had this to say, “What good is it, my brothers, if a man claims to have faith but has no deeds? Can such faith save him? Suppose a brother or sister is without clothes and daily food. If one of you says to him, ‘Go, I wish you well; keep warm and well fed,’ but does nothing about his physical needs, what good is it? In the same way, faith by itself, if it is not accompanied by action, is dead.” (James 2:14-17) How can we claim faith in Christ and not answer God’s call to fulfill His plan? No matter the situation; in all areas of our lives. How can we claim the hope of Christ if we constantly fear the things of this world? How can we expect to see Jesus welcome us into eternity if we do not allow eternity to exist in our own lives today — now — while we can still testify to others of Christ’s Gospel message? The “evidence of things not seen” is not in a story such as Colton Burpo’s, and it’s not in acquiring physical wealth, pleasure, or power and claiming God’s blessings as a result. No! Such evidence of our faith is in our deeds — our obedience and our sacrifices. We must live a life that reflects Christ. We must live a life that acts on its faith, and its hope (2 Corinthians 13:5). We must be Christlike in all areas of our existence — the physical, the mental, and the spiritual. This is the life of a true worshiper of God. If you claim to be a Christian — a Christ follower — and you cannot claim such faith as I have just described, then consider that you are possibly not a true believer. If you work in a church, serve in a church, or attend a church weekly and yet doubt any part of the holy Scripture’s teachings — needing evidence and proof before you can fully say you believe — then stop calling yourself a pastor, worship leader, teacher, or follower of Christ. Resign yourself to become a student of the Holy Bible — the very Word of God — until such a time as your “faith” can became real to you through your actions, and not through sight. A true worshiper of God is called to “deny himself and take up his cross and follow Me [Jesus Christ]. 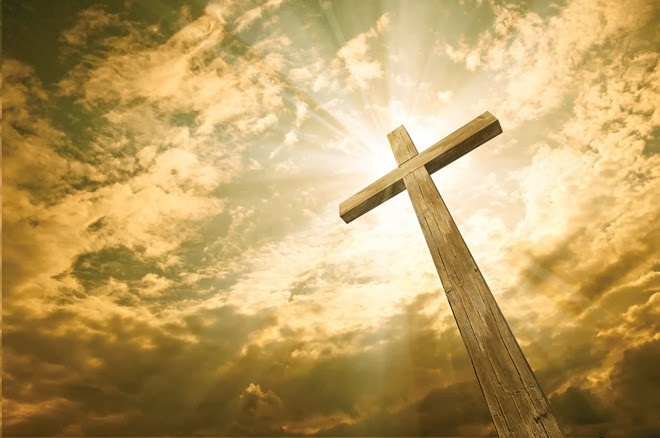 For whoever wants to save his life will lose it, but whoever loses his life for Me will find it.” (Matthew 16:24b-25) The cross is an instrument of pain, torture, and death. It’s not a symbol of blessing, comfort, or peace even though it is because Christ willingly endured the pain, torture, and death of the cross that we can have the assurance of God’s blessing, comfort, and peace (John 10:18). Taking up the cross of Christ means we must expect to endure pain in this life; to be tortured from time-to-time in some way or fashion (1 Peter 4:12-14). And we must embrace the truth that death — physical death, anyway — awaits us all, but not before God says so. It is God Who has numbered our days (Job 14:5; Psalm 139:16). God will keep us here until He has made us as Christlike as He possibly can (Psalm 138:8; 2 Corinthians 3:18; Philippians 2:13), then the hope of our faith will become reality for all of eternity. In closing recall with me theses words from the publisher of the book Heaven Is for Real. Thomas Nelson claims that this book will “forever change the way you think of eternity, offering the chance to see, and believe, like a child.” What child has ever seen Santa Claus deliver his/her toys at Christmas and believed? What child has ever seen the Easter Bunny, the Tooth-fairy, or any other fictional character and then believed. Children trust what their parents tell them — blindly believing that what is being said is the truth. Colton Burpo didn’t believe because he saw heaven. Colton believed because his father, the Rev. Todd Burpo, taught him concerning our hope of heaven in Christ. Colton only saw what he already believed to be true. What he saw simply further confirmed his faith. Heaven Is For Real by J.Scott Harden is licensed under a Creative Commons Attribution-Noncommercial-No Derivative Works 3.0 United States License. All rights reserved. The brief information quoted from this book’s press release appears curtesy of Thomas Nelson, Inc. and Christianbook.Com. This is the product description for the Thomas Nelson publication that became a New York Times #1 best seller. 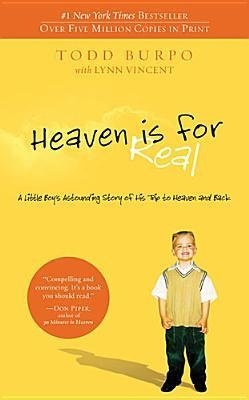 Since its release in 2010, Heaven Is For Real has captivated the hearts and minds of literally thousands of people. And now, there’s the 2014 release of the movie by Sony/TriStar Pictures. According to the publisher, the book tells the true life story of when Colton Burpo survived an emergency appendectomy. Apparently his appendix had ruptured in his body and was poisoning his system. Colton’s family was overjoyed at his miraculous survival, but they weren’t expecting the story that would emerge in the months to come. For Colton’s story — as beautiful as it was extraordinary — would detail his trip to heaven and back. You see, the soon to be four year old Colton, began telling his parents that he left his body during surgery — and gave proof by describing exactly what his parents were doing in another part of the hospital during his operation. He also talked of visiting heaven and relayed stories told to him by people he met there whom he had never met in life. Colton shared events that even happened before he was born. He continued to astound his parents with descriptions and obscure details about heaven that appeared to match the Holy Bible exactly, though he couldn’t even read yet. Whether you read the book or see the film, Heaven Is for Real is said to forever change the way you think of eternity, as the story offers humanity the chance to see, and believe, like a child. I’ve not yet read the book, but I have seen the movie, and I was moved in an entirely different way. Maybe it’s because I’m already a believer that I was not astounded by Colton’s details of heaven. As the publisher of the book indicated, nothing was disclosed (at least in the film) that could not be supported in Scripture. I realize that there are many theologians, both prominent and otherwise, who have debated the truthfulness of this father’s retelling of his son’s experience. Again, I have not yet read the book so I will not enter into that debate. No; what astounded me most about this story was that it consisted of so many “believers” (pastors and lay-persons, alike) who had to “see,” and “hear” Colton’s evidence for heaven to know that it is real. If our hope is in Jesus Christ, then what is the result of our hope? Why must Jesus even be our hope? 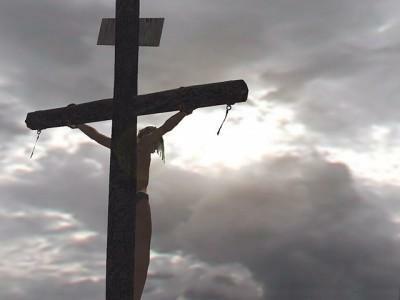 God’s begotten Son must be our hope, because humanity is depraved and lost in self worship. This self-worshiping nature has doomed us to an eternal separation from our holy Creator. People are too selfish to even begin to know how to purify themselves and over come their evil essence, known as sin. It required the perfection of a true worshiper to over come the imperfections of humanity’s self-worshiping nature. That pure and perfect worshiper of God is His very own begotten Son, Jesus Christ (2 Corinthians 5:21). Jesus had to willingly lower Himself to the essence of a self-worshiping human, while all the while not participating in self worship. Christ had to live as one of us, and experience all of our hurts, temptations, and pains, and remain a true worshiper of God to become a pure and perfect blood sacrifice capable of cleaning up all of humanity’s sins. Jesus did this, and the result was our restoration to God the Father, by faith in Christ (Romans 3:21-28; Philippians 2:5-11). “Now, brothers, I want to remind you of the Gospel I preached to you, which you received and on which you have taken your stand. By this Gospel you are saved, if you hold firmly to the word I preached to you. Otherwise, you have believed in vain. For what I received I passed on to you as of first importance: that Christ died for our sins according to the Scriptures, that He was buried, that He was raised on the third day according to the Scriptures, and that He appeared to Peter, and then to the Twelve. After that, He appeared to more than five hundred of the brothers at the same time, most of whom are still living, though some have fallen asleep. Then He appeared to James, then to all the apostles, and last of all He appeared to me also, as to one abnormally born. For I am the least of the apostles and do not even deserve to be called an apostle, because I persecuted the church of God. But by the grace of God I am what I am, and His grace to me was not without effect. No, I worked harder than all of them — yet not I, but the grace of God that was with me. Whether, then, it was I or they, this is what we preach, and this is what you believed. Did you get that? If we truly believe that Christ is our hope beyond the grave, but do not truly believe in heaven, then we are to be pitied more so than any other religious group. Why? Because, if heaven isn’t real, then neither is Christ’s resurrection. 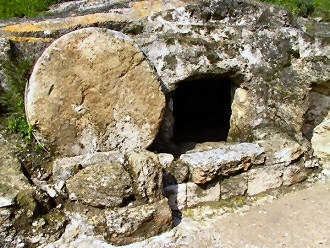 And if the resurrection of the dead isn’t real, then we are still condemned as self-worshipers. Humanity is still lost and depraved. Don’t get caught up in the need for evidence, when it comes to our faith. The evidence that does exist — the evidence that does substantiate our Christian claims regarding Christ, or heaven, or anything else disclosed in the holy Scriptures — should not be the cause of our faith, but simply an edification of our belief. The “punctuation” at the end of our “sentence,” and not the “subject” of the “sentence,” itself. As the author of the book of Hebrews stated, “Now faith is being sure of what we hope for and certain of what we do not see.” (Hebrews 11:1) Faith is believing without seeing, and not believing because you have seen. In part two of this special commentary on true faith, we will conclude with an understanding of what real faith should look like in the everyday life of a person claiming to be a Christian — one who follows the teachings of Jesus Christ, God’s begotten Son. A Witch’s Invitation, by CCM artist and actor Carman, was originally released on his 1990 album entitled Revival In The Land. This “story song,” was one of many — in a long line of hits — that helped make Carman stand out as an exceptional artist within contemporary Christian music. A Witch’s Invitation, is all about a warlock (male witch) who invites a Christian over to his house for the chance to brag and gloat about his demonic powers. The Christian hesitantly accepts, due to being a bit intimidated, but in the end is able to reveal where real power comes from. God is the source of true power (1 Chronicles 29:11; Psalm 28:7; Colossians 1:16), and that power can only be accessed through a relationship with Jesus Christ. 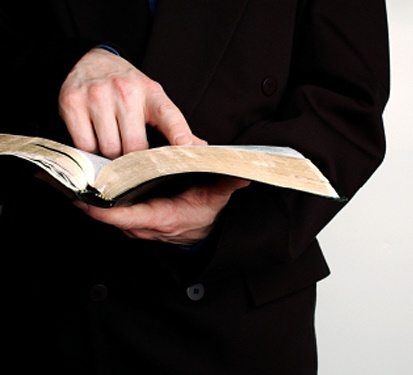 The Christian, in this story, uses a key word in his summary of God’s power. The word is “rejoice.” He says, “When you [warlock] tossed that book in my lap, you gloated with a sinister victory. You rejoiced when you saw your name in black and white. Now I rejoice, but not that your counsel of demons are subject to Jesus, but that my name is written in the Lamb’s [Christ’s] Book of Life!” What a contrast between how the warlock “rejoiced,” and how the Christian did the same. 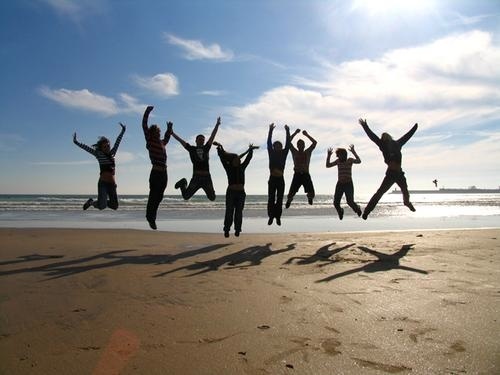 Rejoicing is an essential part of our worship, and I picked this song just to reveal the stark variance between how a pagan finds delight and how a true believer is enraptured. The ungodly are prone to bragging and gloating over themselves; over their own selfish achievements. Whereas a true worshiper of God finds his/her ability to rejoice based on what The Almighty has done in and through their lives, for the benefit of others. 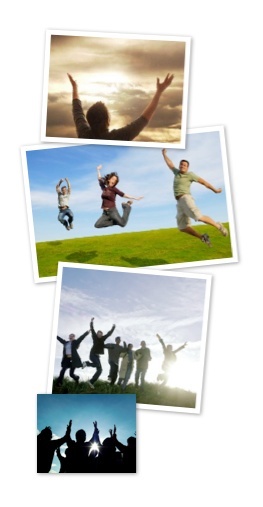 Self has no place in that moment where true rejoicing transpires. It’s because of God’s blessings, God’s graciousness, that we can and should be humble before Him and grateful to Him. It’s in God’s presence that we receive true joy, and as The Joshua Project has revealed before, giving is what ushers us into God’s presence. 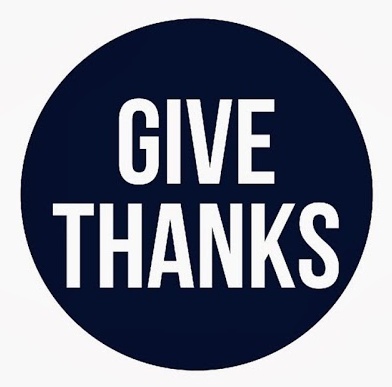 No matter what we set our minds to do, if we give of ourselves joyfully, if we give thanks to God in all our circumstances, then we can rejoice knowing we are doing God’s will (1 Thessalonians 5:16-18). After all, He made all things with this purpose in mind. – J — Jesus — making Him first in our lives. – O — Others — placing others before ourselves. – Y — You — allowing selfish wants and desires to fall behind those of Christ’s and others. I keep coming back to this acrostic, because it is such a crucial part of being a true worshiper, and since it is the path to real joy then true rejoicing can only come-to-pass in our lives as we act in a similar manner. First, we must find delight in the acts of God. Acts that may come through us, or through others, as we approach Him and exist in His presence. Second, we must be glad when God’s blessings appear in the lives of others, whether we think them deserving or not, and we should always encourage people to rejoice in the same. Stop allowing jealousy and a judgmental attitude to take control of your life’s circumstances. Allow God’s love to extend through you, and from you, so that the truth of Christ can rule your body, mind, and soul, and lead others to do the same. A Witch’s Invitation lyrics and music written by Carman, and Keith Thomas. Copyright © 1990 Benson Records. Video made available by Jason Ministries, Spring Arbor Distribution, and The Benson Company, Inc; Copyright © 1991 All Rights Reserved. Forgiveness, by CCM artist Matthew West, is from the 2012 album entitled Into The Light. The song was written by Mr. West after he heard an incredible story about a woman who lost one of her four children, a twin daughter, to a drunk driving accident. As the attached video explains, the man who had caused the crash, that had killed both this young girl and her friend, was sentenced to twenty-two years in prison. But according to Renae, the mother of the deceased child, it was she that felt like a prisoner. You see, bitterness and hatred had been building up inside of her soul, and she felt miserable and entrapped. It wasn’t until she felt compelled to reach out to this young man — while he was still in prison — and tell him she had forgiven him, that she began to feel released from her anger and her hate. In fact, she actually worked to see this young man’s sentence reduced to eleven years, and she has accepted this young man into her family, as one of her own. Mr. West indicates that writing this song was very hard, because forgiving someone who has wronged you is extremely difficult. So the chorus became a prayer to God, saying, “Show me how . . .” Humanity must be shown how to forgive, we cannot do so on our own because it goes against our sinful nature. It’s God who knows how to truly forgive. – Genesis 3 — Adam and Eve choose to believe the lies of Satan, disguised as a serpent, instead of the truths of their Creator. God knows that humanity has chosen sin over righteousness, and seeks out the man and the woman. Adam and Eve are found by God to be hiding and scared. They are no longer clothed in His glory, but are naked and covered in leaves and vines. God gives them both a verbal scolding. Exclaiming to them the consequences of bringing wrongdoing into the world, but then shows compassion and forgiveness by killing an animal, skinning that animal, and preparing proper clothing to cover the man and woman’s nakedness. In doing this, God established the first example that rings true throughout the Bible, “Without the shedding of blood there is no forgiveness” (Hebrews 9:22), and without forgiveness there is no life (Romans 6:23). – Genesis 6-8 — The world had become over run by evil. God was sorry that He had ever created humanity, and was poised to destroy all that He had made; ready to demolish all that He had once looked upon as “good.” (Genesis 1:10b) But one man, named Noah, found favor in God’s sight. God chose to spare Noah, and his family, and in doing so also chose to spare a portion of His lower creations; those considered a part of the animal kingdom. So an ark was built to house Noah, his family, and all the creatures God selected. The rains came, and the flood waters rose, and humanity’s sins were judged. Yet, God’s tender mercies were placed upon Noah, and all that were housed in the ark. When the waters recessed, and the ark was again set upon dry ground, Noah built an alter and sacrificed animal flesh to honor God’s loving kindness and forgiveness. Again, without the shedding of blood there is no forgiveness, and without forgiveness there is no life. 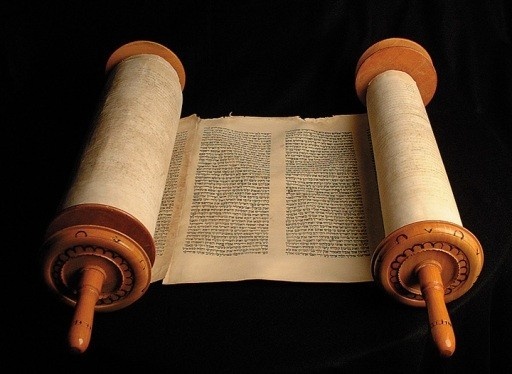 – Genesis 22 — God has chosen a specific man to make a covenant with. This covenant would be the foundation by which God would reestablish His lost relationship with mankind. The man’s name was Abraham, and the principle of the covenant would be established through the testing of Abraham’s faithfulness. You see, God had promised to make Abraham the beginning of a “great nation” (Genesis 12:2-3), but Abraham’s wife was barren and could not have children. Nevertheless, God continued to stand by His promise and grow Abraham in his faith. It wasn’t until Abraham was about one-hundred years old, and that Sarah was about ninety years old, that God fulfilled the promise of a child. But a short twenty years later, God asks Abraham to sacrifice his only son, Isaac, back to Him. Abraham, now nearing the end of his days, doesn’t question God. He gathers up what is needed for the sacrifice, including his one and only son, and heads out to the holy mountain of God. Isaac, old enough now to know what is expected at a sacrifice, begins to question his father about what they are going to sacrifice. After all, he sees no animal. Abraham stays focused and simply responds with, “God, Himself, will provide.” (Genesis 22:8) Abraham arrives, prepares the alter, binds up his son, and places Isaac on the alter. As Abraham raises his knife to return Isaac to God, he is stopped. God praises Abraham for his faithfulness, and provides a ram for them to complete their act of worship. Once more, God intercedes for humanity, and provides a sacrifice that would represent an even greater oblation. For by this special offering, yet to come, all of humanity would be forgiven, and allowed to experience abundant life. You see, often this theme appears throughout the Old Testament, until it is ultimately played out in the New Testament through the sacrifice that God, Himself, makes. The supreme sacrifice, hinted at in Genesis chapter twenty-two, that would cover all sins that mankind had committed throughout history, during the period it took place, and since. That offering, of course, was God’s only begotten son — Jesus Christ. God’s son willingly became sin, though He had never sinned, so that through His death humanity could be forgiven (Isaiah 53:5; 2 Corinthians 5:21). Forgiveness truly is divine, and it is strong enough to cover over all our wrongdoings. All we need do is accept it (1 John 1:9), and then give it to others (Mark 11:25). – Is there someone I need to forgive? – Is there someone I need to ask for forgiveness from? – Can I forgive myself for what I have done? – Have I really embraced God’s forgiveness? God has proven that He is ready, willing, and able to forgive us. All we must do is accept God’s forgiveness, and forgive others, then be ready to embrace life — abundant life! Forgiveness lyrics and music written by Matthew West. Copyright © 2012 Sparrow Records. Video made available by Jason Ministries and Sparrow Records; Copyright © 2013 All Rights Reserved. All in Favor, by CCM and Gospel artist Larnelle Harris, was originally released on the 1987 album entitled The Father Hath Provided. This wonderfully exciting Gospel song, published by Benson Records, is all about encouraging Christians to testify. To bare witness concerning their love and devotion towards Jesus Christ, to other people. 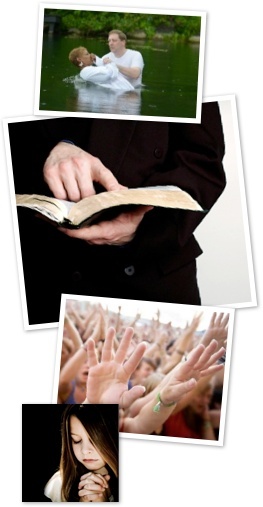 Giving our testimony to others, as we have said before, is an important part of our worship. But, did you realize that your testimony is a part of a larger act of worship known as confession? 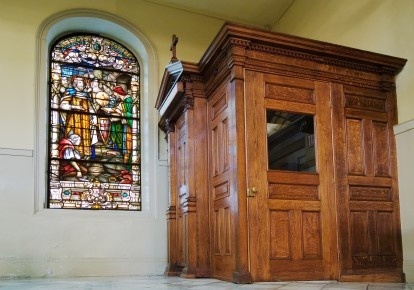 Now the word “confession” automatically conjures up images of a Catholic confessional, for many people. But before we allow our minds to remain on that depiction, let’s look closer at the meaning of the word. – the religious body, or church, sharing their doctrine, or confession of faith. – a statement of one’s creed: his/her words were a part of his/her political ideology. So, let’s come to terms with the two meanings behind this very important word. Confession is one of many acts of worship that we are commanded to participate in. Why, our very first act of worship — embracing the Gospel message of Jesus Christ — can’t take place unless we first confess our sins (1 John 1:9), and then second confess with our mouths that, “Jesus is Lord” (Romans 10:9). Both aspects of the word “confession” are present within this redemptive act of worship, known as salvation. Confession is also important because it points us to acknowledging God’s pure, sovereign, and holy nature; just as it also allows us to acknowledge our fallen state. We read in Habakkuk chapter one, verse thirteen, “Your [God’s] eyes are too pure to look on evil; you cannot tolerate wrong.” This indicates both God’s perfect goodness (purity) and our imperfect wickedness (evil). We can never confess, or testify, to the goodness of our Creator until we come to terms with why we need His forgiveness — His salvation. Sovereignty gives God the authority to love whom He chooses, to punish whom He chooses, and it maintains God’s purpose and deeds; we don’t and can’t do these things because we are sinful (missing the mark). We either accept God’s sovereignty in our lives, through the worshipful act of confession, or we reject it and remove ourselves from God eternally. God’s calling to make humanity one with Himself, again, and to see mankind become more like His only begotten son, Jesus Christ, is truly an act of sovereign grace. But this undeserved, divine grace can only be accessed by humanity, if we worship God through the two part act of confession — admitting our guilt and testifying of Christ’s Gospel message to others. All in Favor lyrics and music written by Babbie Mason. 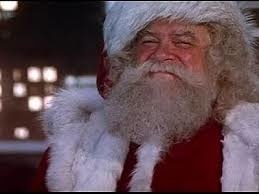 Original version Copyright © 1987 Benson Records; Live in Brooklyn version Copyright © 2010 Mansion Entertainment. Video made available by Jason Ministries, and Spring House Music Group. Manufactured by EMI Christian Music Group, a division of Capitol Records; Copyright © 1994, 2012 All Rights Reserved.